Showing 14 articles from November 8, 2016. New Grays Harbor College President Dr. Jim Minkler and other GHC representatives appeared at the college's Riverview Education Center in Raymond on Nov. 2, where they heard input on how GHC might better serve Pacific County Residents. A similar meeting was scheduled for Nov. 3 at the Columbia Education Center in Ilwaco. On Oct. 27, Nathan C. Oeser, age 67, of Hoquiam was arrested by Hoquiam detectives after he allegedly conducted a notary service on a state prison document for an undercover Hoquiam officer. Kids and parents braved the rain last Monday as they went door-to-door among Elma businesses as part of the 18th Annual Downtown Trick or Treat event. Owning a building in a small town, in these uncertain economic times, isn't always easy or fun, but it can be. Harry's Place in Toledo, formerly The Tap House, is one of those iconically achy, breaky propositions. Now under the management of the wife and husband team of Janet and Jack, Harry's place across the street from the loggers museum, next to the administrative offices of the Toledo School District, may be a headache for the owner duo, but it's a dream and a pleasure, too. Authorities in Hoquiam are currently investigating the circumstances surrounding several recent fires that have caused damage to unoccupied homes. It's during this time of year that it is important to remember all veterans who have served our country and that includes veterans who served in Vietnam. My uncle, William Sorensen, grew up in Winlock during the '50s and '60s when it was an ideal small town, with no concerns of violence or war. 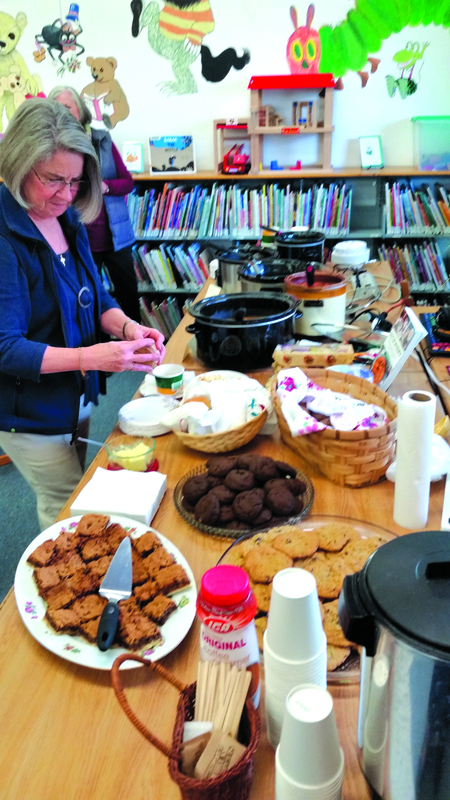 About 50 people stopped in for a cup of soup and a presentation by Maggie Stuckey, author of "Soup Night" on Nov. 4. Special thanks to the Friends of the Winlock Library for sponsoring this event, Pat Maninfior, Mike McDonald and Jessie Camerer for providing soup and support. 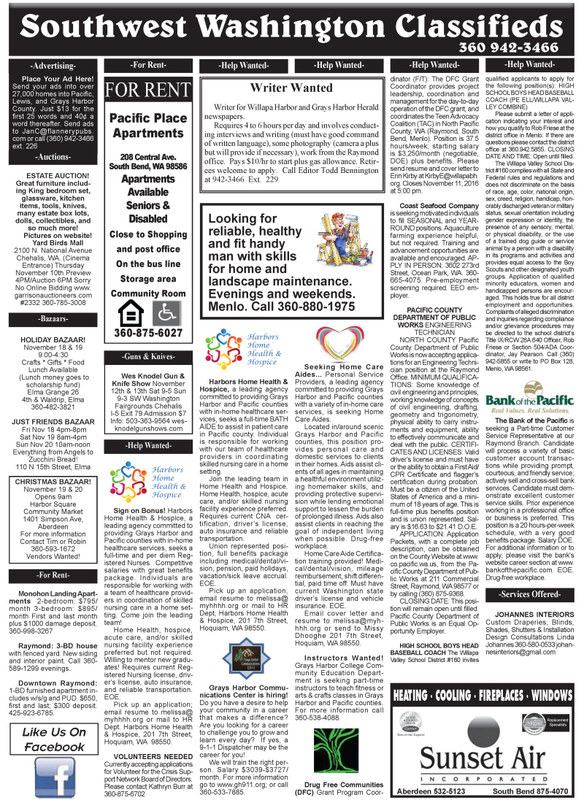 Thanks also to Winlock City Hall's staff who loaned extra tables. A pot of soup was also provided by Lisa's Diner in Winlock. It comes every four years, this election cycle that includes a contest for the presidency. We get to choose, through an old, lame process, the person we want to represent us to the world, the chief executive of arguably the greatest nation ever, on earth. The Friends of the Winlock Timberland Library will hold their Ninth Annual Artisan Silent Auction featuring local handcrafted items beginning Tuesday, Nov. 8, at the library. Final bids will be accepted Wednesday, Nov. 23, at 2 p.m. The Raymond City Council was met with multiple issues brought forth by the public at the Raymond City Council meeting held on Monday, Nov. 7. The first member of the public to speak was Superintendent Steve Holland of the Raymond School District, who was accompanied by a parent of a student in the Raymond School District. South Bend High School Football Coach Tom Sanchez gives his son, senior running back A.J. 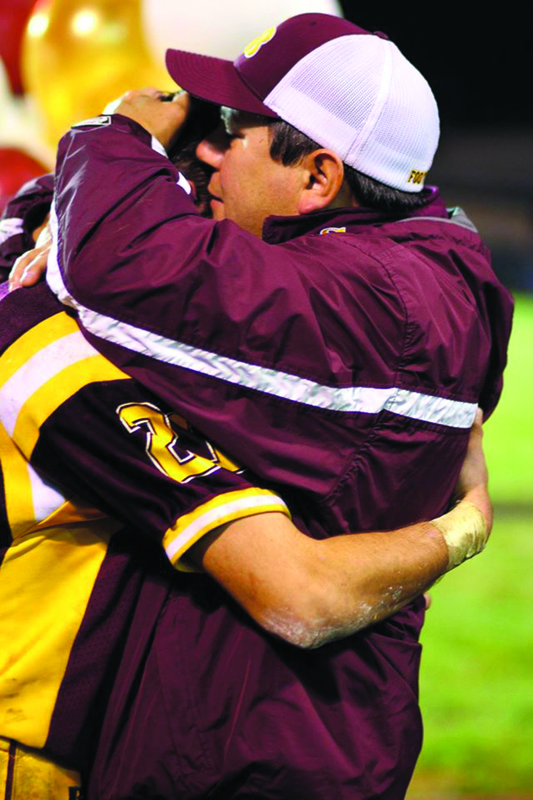 Sanchez, an emotional hug following South Bend's win over Ocosta on Oct. 28. A.J. had five touchdowns for the Indians en route to victory. The Andy Hackbarth Trio entertained with their eclectic musical style at a Sunday Afternoon Live-sponsored performance at the Raymond Theatre on Nov. 6. On Sunday, Nov. 6, a talented group of musicians calling themselves "The Andy Hackbarth Trio" performed at the Raymond Theatre. Popcorn and drinks were served as usual, and those in attendance almost filled both the top and bottom seating sections of the venue.